When I search for wrUrlfit, it says that the file belongs to Webroot. 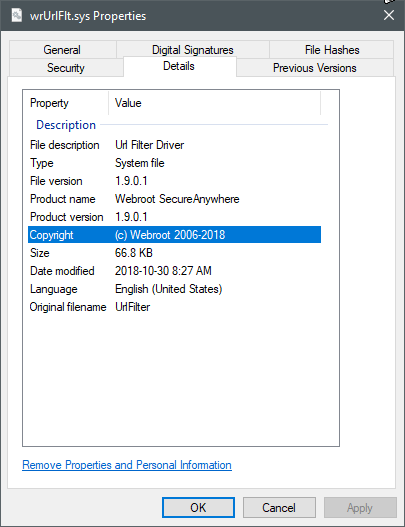 Do I need to uninstall webroot while windows upgrades it's files? wrUrlFlt is for the Web Threat Shield (Filter) within WSA and if you continue to see this you can always Submit a Support Ticket and they can take a look and help you sort it out. Also I don't read much into Event Viewer as if I tried to read everything in there it would drive me crazy. Also on 2 of my systems Updating to 1809 I didn't did anything with WSA and it installed fine. Also in most cases it doesn't hurt to do a clean reinstall of WSA to see if the errors go away?